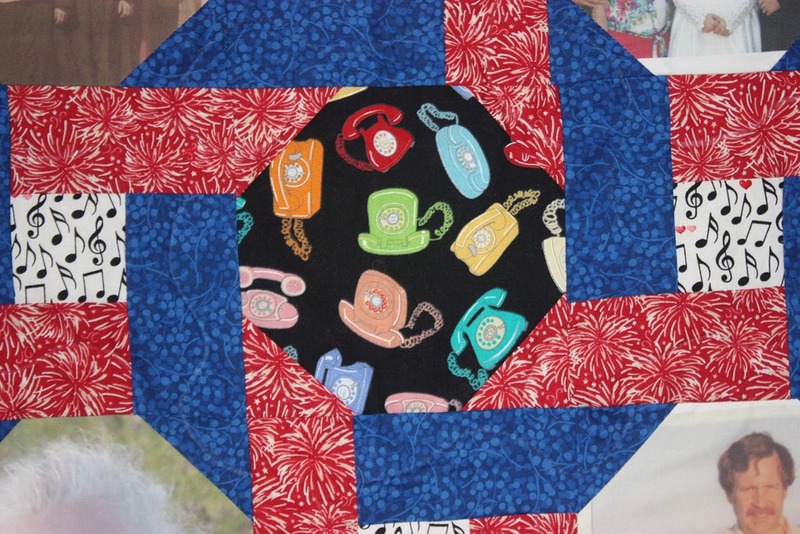 I have talked about “my quilt” a couple of times and use it at a backdrop when I am “hangin’ out” with my cousin Dear MYRTLE. 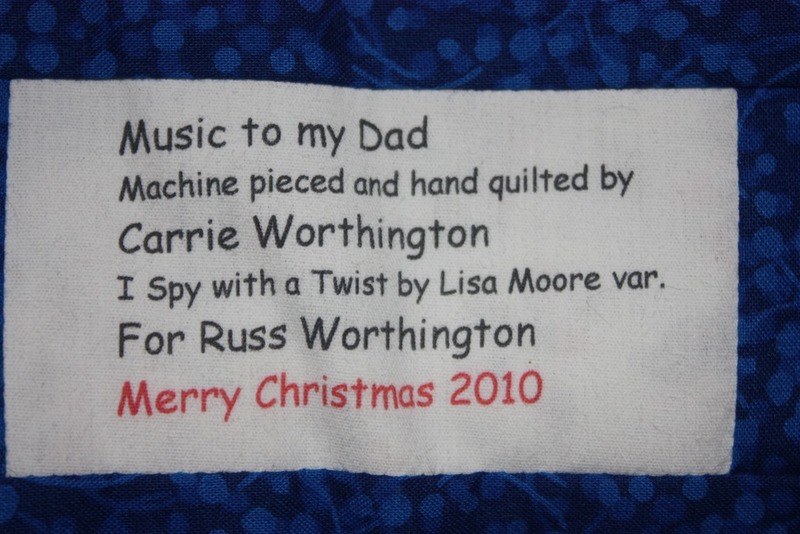 As you can see, it was a Christmas present from my older daughter Carrie Worthington. 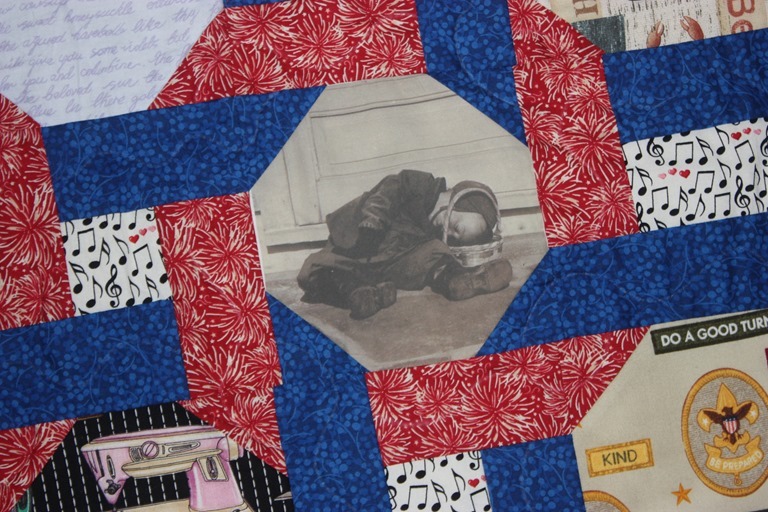 She captured, in this one quilt, the pieces of my life, I’ll share parts of this quilt here. Music to my Dad, she says. 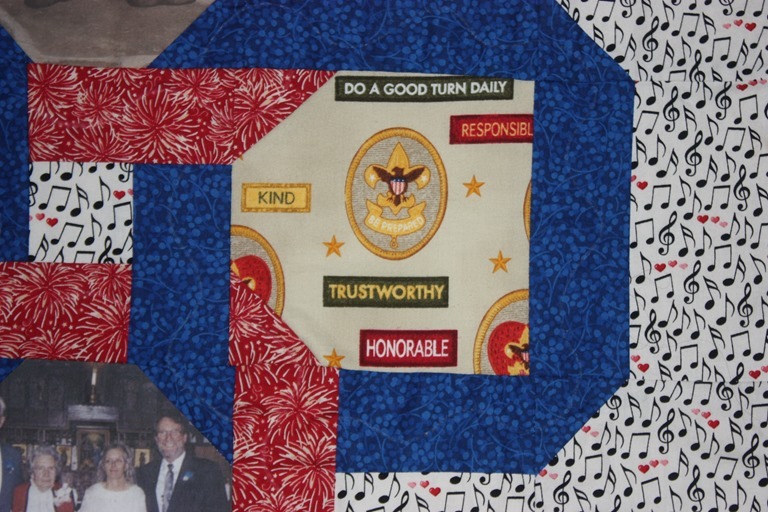 That is the boarder and background to this side of the quilt. 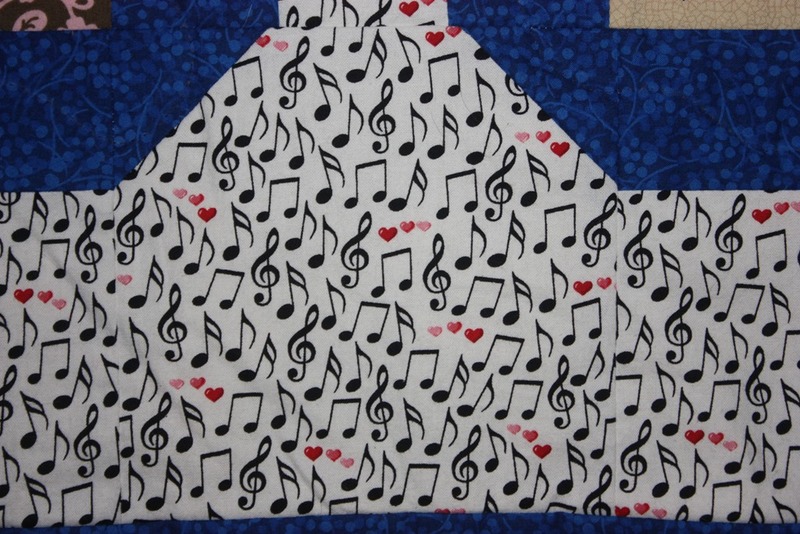 Music has been a large part of my life. For example, I went through the US Coast Guard boot camp, in Cape May, NJ as a member of the marching band. Of course 4 years of high school and 2 years of college playing in the band and orchestra in both didn’t hurt. But singing is what I have done more of. Started out in a church choir with my brother and Grandfather. My dad, couldn’t carry a note in a bucket, but he was the crucifer for the choir. I also sang Barbershop Quartet music in several chorus’ and several quartets for about 15 years. Competed with a chorus in 1982 where we placed 2nd internationally. 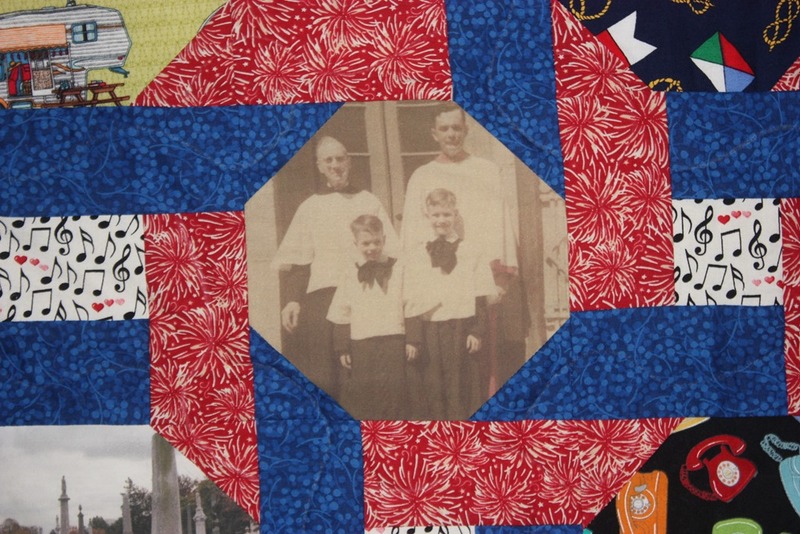 But, lets go back a generation to pick up my mother in this quilt. 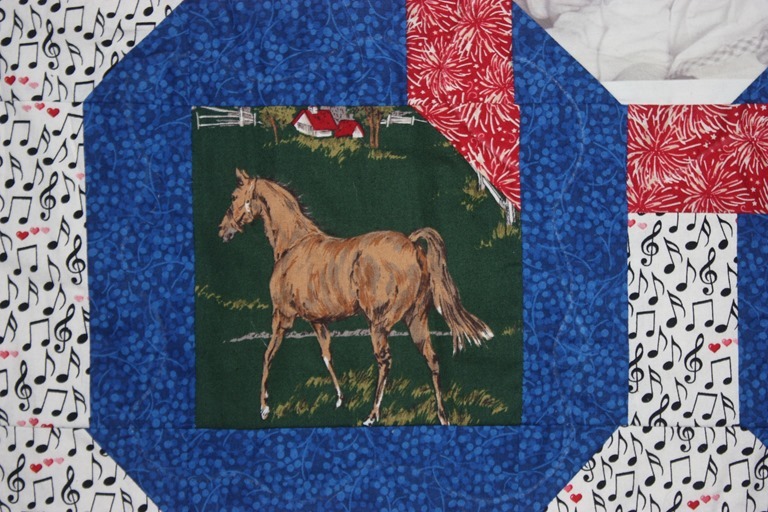 She loved horses and had a number of them over her life. So, Carrie’s grandmother was remembered. What about my dad? Besides a round or two of golf, it was about fishing. OK, I like fishing too. 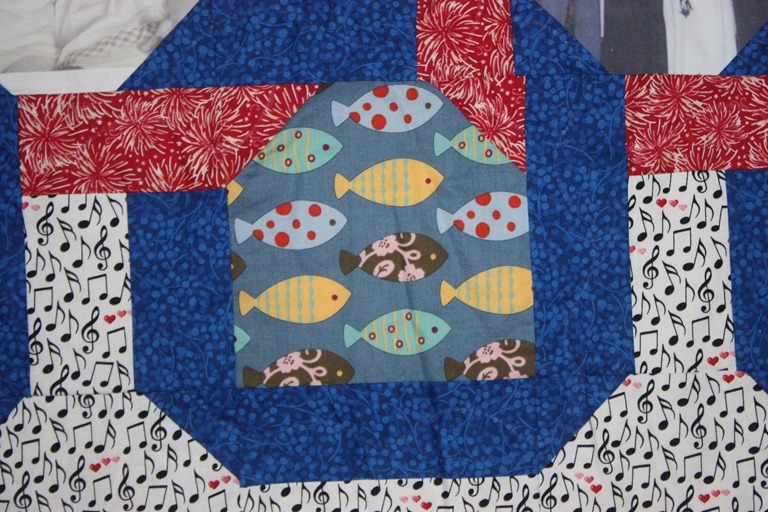 But, this also picked up that her other grandfather owned a fish store, here in NJ. I was a scout. Did that help me in the US Coast Guard? Oh yeah. She didn’t miss to show one of her skills, but the skills of her mother. I think this was at Easter, Lionville, PA about 1946 or so. Did I mention we lived in Washington DC for 15 years, and both daughters were born there? 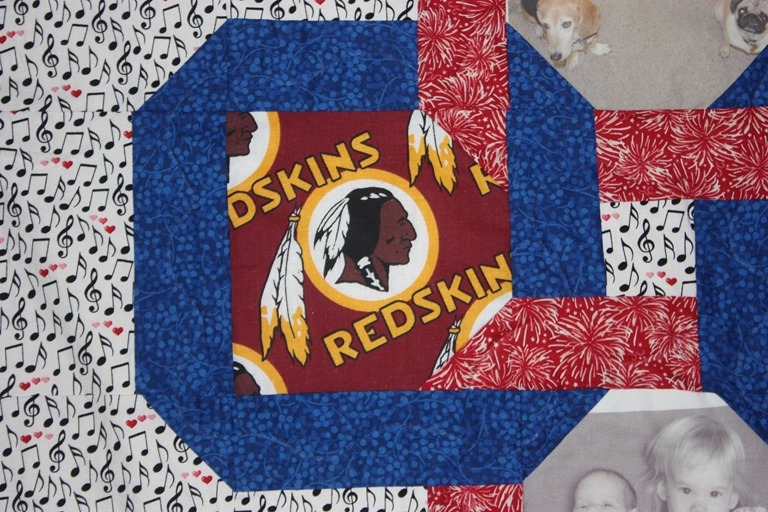 We may live in New Jersey, but Jenn and I are still Redskins fans. My 30 years working for AT&T wasn’t missed. Jumping ahead many years, Carrie’s wedding with Jenn and my parents. Maine was / is a favorite place to visit, so shortly after Patti and I were married, we went to visit the home of one of my ancestor’s in Southwest Harbor, the Mountain House on the Carroll Homestead. Did I mention that Patti also does family history research? 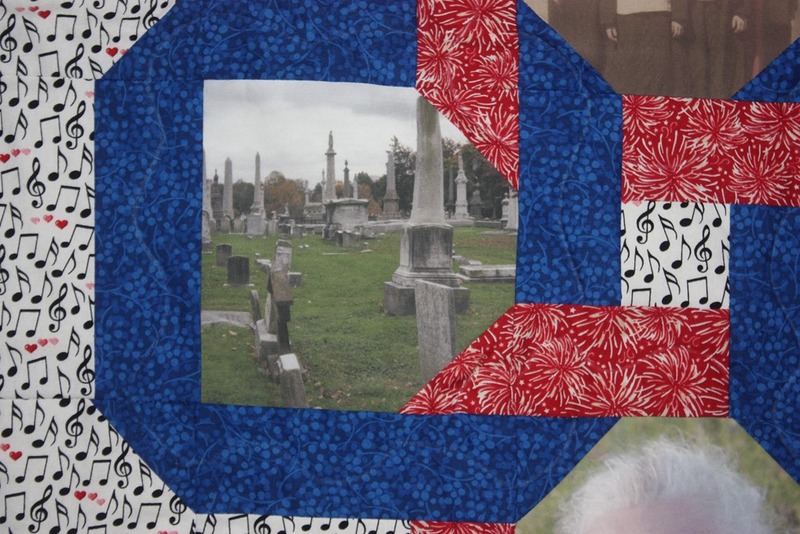 You just can’t drive down the road and pass a cemetery without stopping. This entry was posted on Sunday, July 7th, 2013 at 5:42 pm and is filed under Family. You can follow any responses to this entry through the RSS 2.0 feed. You can leave a response, or trackback from your own site. You’re Welcome! You forgot the orchard fabric. I got the picture of you on the porch from the book your mom put together and I got to scan all of the pictures when we pulled it out of the garage. Didn’t forget the back and a couple of other pictures. I need to scan them also. Just haven’t had enough time to work on that project. When the fall comes, I’ll start. Thank you. 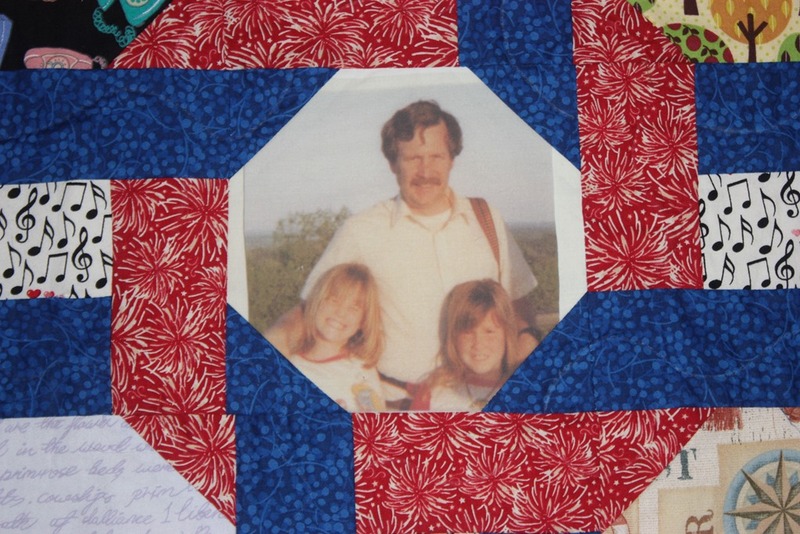 What a wonderful daughter, Russ, and what a wonderful gift! Wow! I’ll have to find out how Carrie scans the pictures onto cloth and/or find someone I can pay to do it for me. 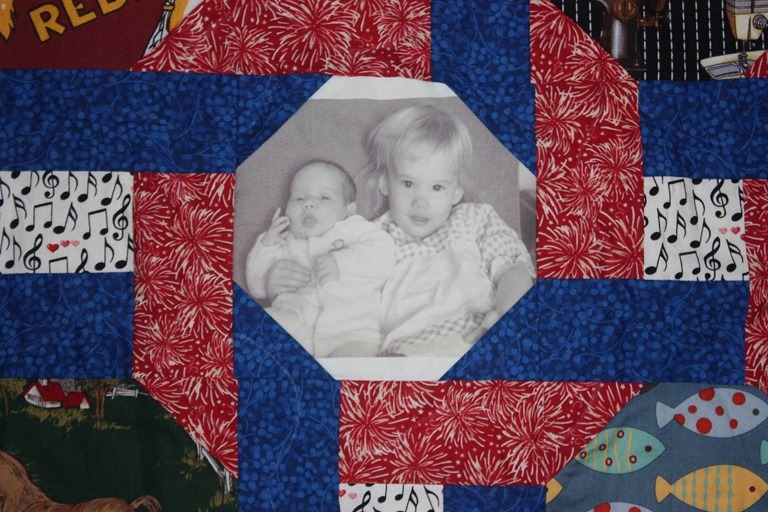 Would love to do a picture quilt for my daughter and maybe one for her husband, too. Fantastic! 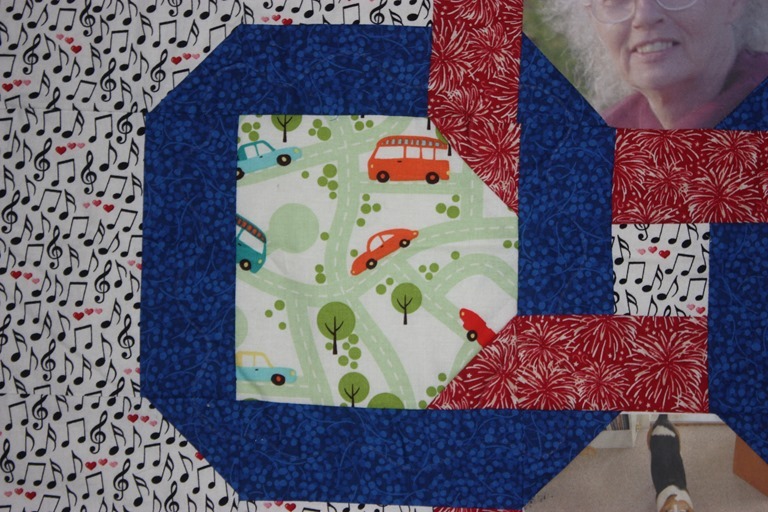 Don’t know how she did it, for sure, but she has done a number of quilts, each one is very different, but has a theme. A couple of companies make fabric that is designed to go through a printer. It has a paper backing to give it the stiffness to feed it through. 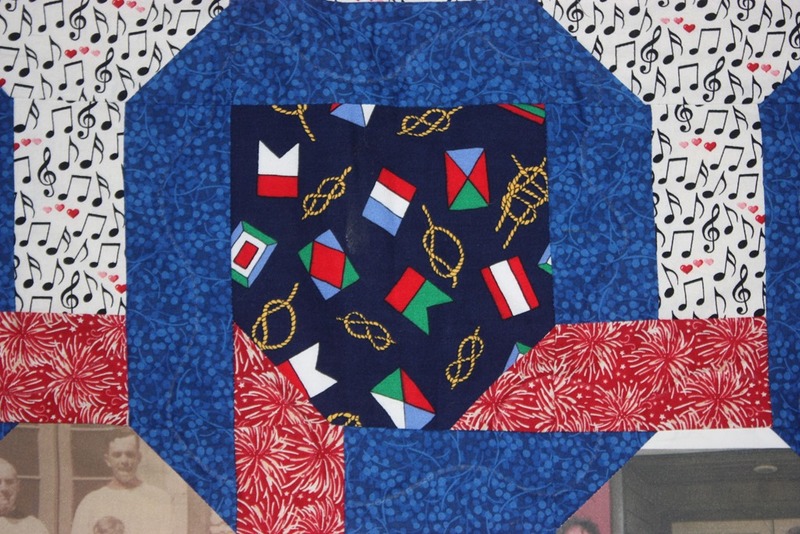 Your local quilt shop probably sells it. Great. Folks were asking. Thank you. Beautiful job Carrie. It gives us both a smile when we “relive” the moments you captured. You are truly gifted. 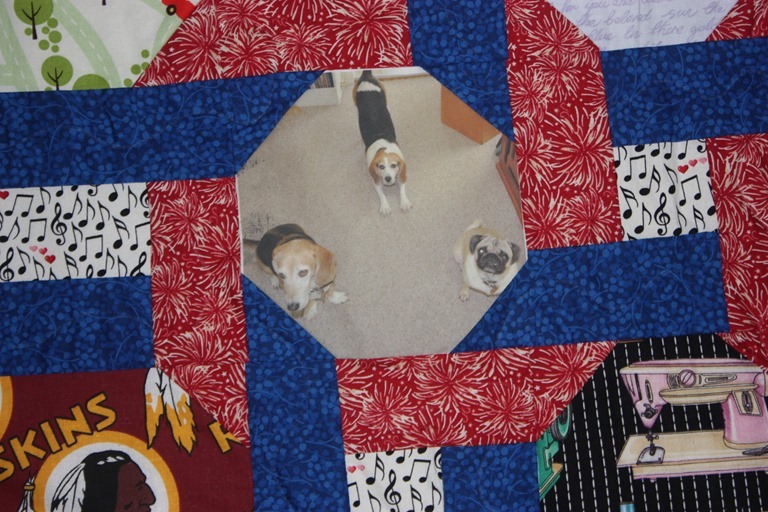 Love the quilt, but what’s on the middle white octagon? And Sharon, you can buy special fabric that feeds into your printer at almost any fabric store. It is some writing. I’ll have to check with my daughter where it came from and what it is. I am not sure, as it’s hard to read. Didn’t recognize the hand writing either. It’s just writing, it may even be French. It is a tribute to having decipher handwriting when doing genealogy. Very cool. You are right and the clue was to handwriting bit. That was my problem with it. Nicely done Carrie. 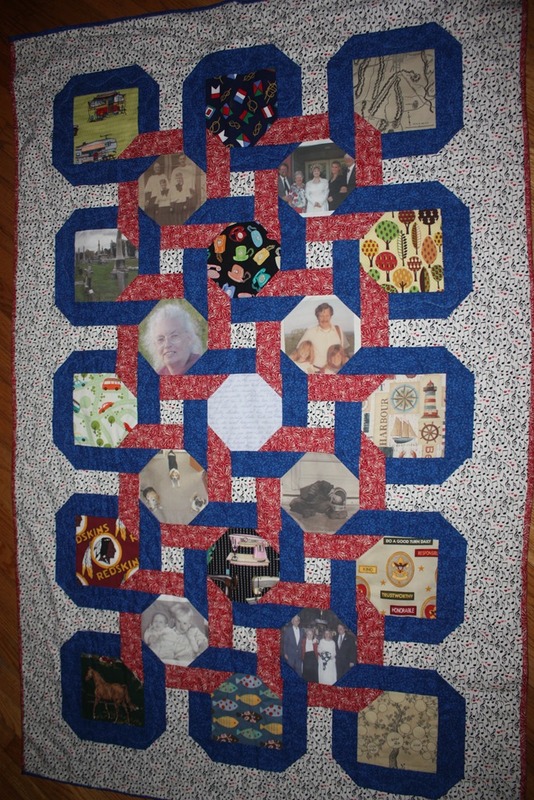 Before my mother died we cut out quilt squares to be sown together at a later time for each of her grandchildren. 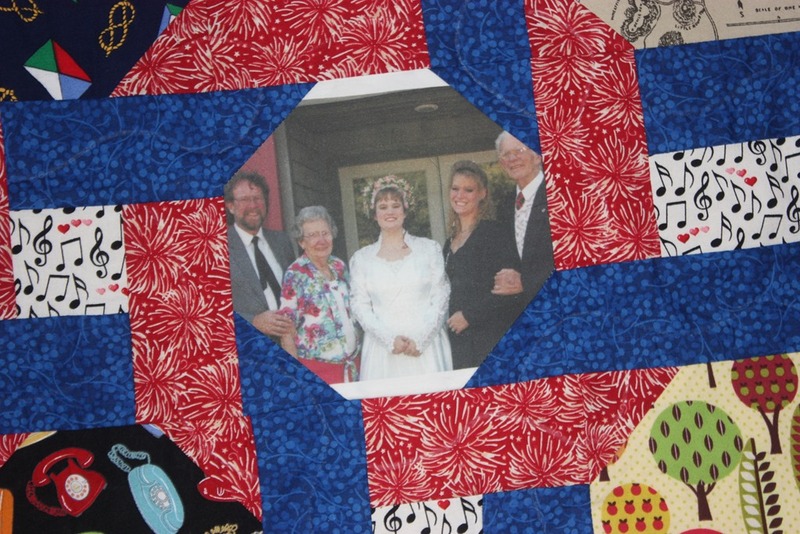 It is my job to give those squares or finished quilt to them on their wedding day. 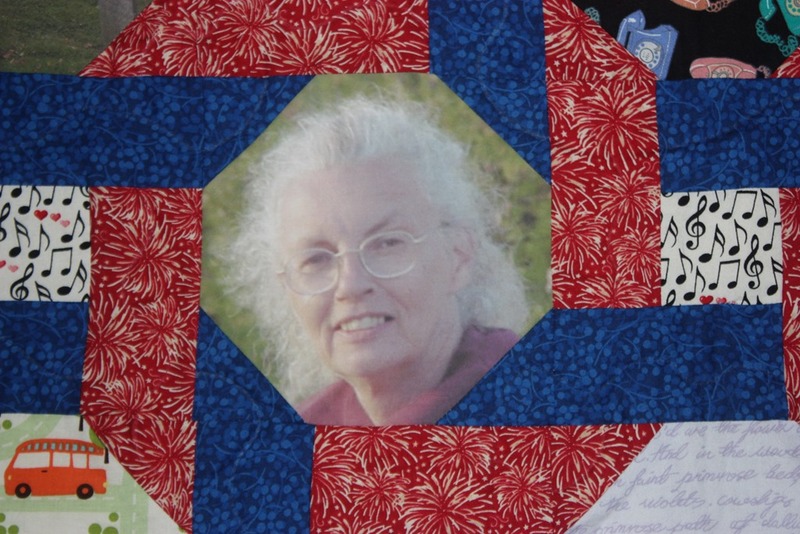 She knew she didn’t have the time to make each of them a quilt like she did for us children. 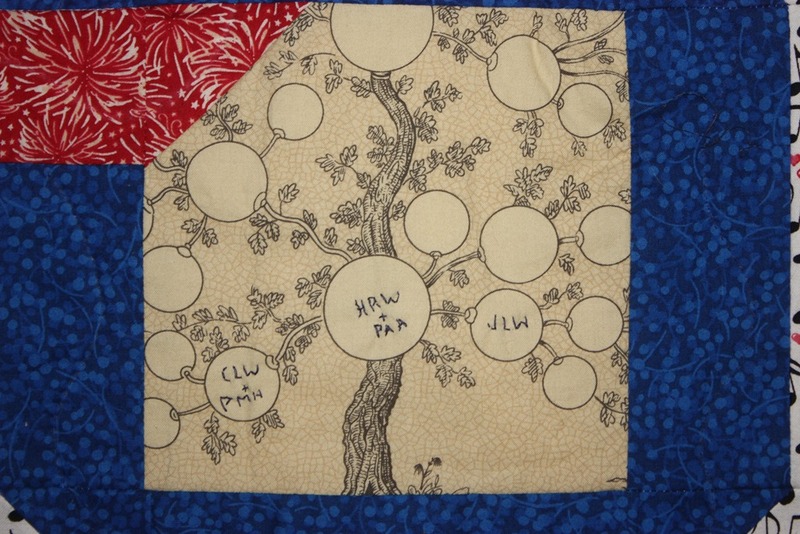 It is a special memory to have a hand made quilt from a loved one. 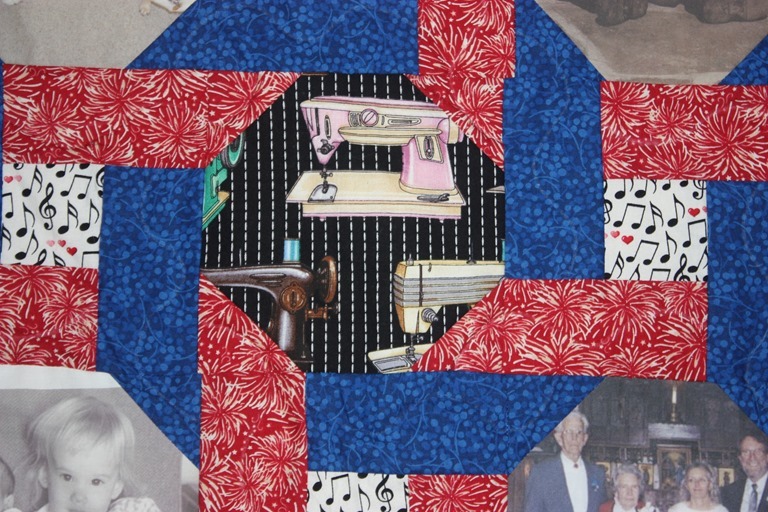 I wish there were people who still know how to quilt. Russ, you are one of the lucky ones to have those memories displayed so beautifully. It was a great gift from my daughter. A fantastic gift! I wish someone would make one for me! Beautifully done and a treasure for sure. Thanks Russ for sharing! Yes it is. She “dun good”.